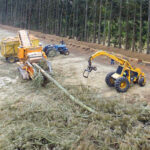 Since 2004, Africa Biomass Company has been at the forefront of the development of biomass processing such as wood chips, biofuels and more in Southern Africa. 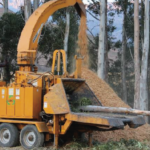 Under the mentorship of Johan du Preez, the co-owner of Môreson Grondverskuiwers, known for service excellence in the agricultural industry since 1924, we established ourselves as market leaders of recycling agricultural wood waste over the past 10 years. Towards the end of 2008, the need and demand for the chipping of orchards increased to such an extent that the strategy of hand-fed chippers was switched to that of horizontal grinders, fed by a mechanical loader. In collaboration with Môreson Grondverskuiwers, we now offer a full range of services.